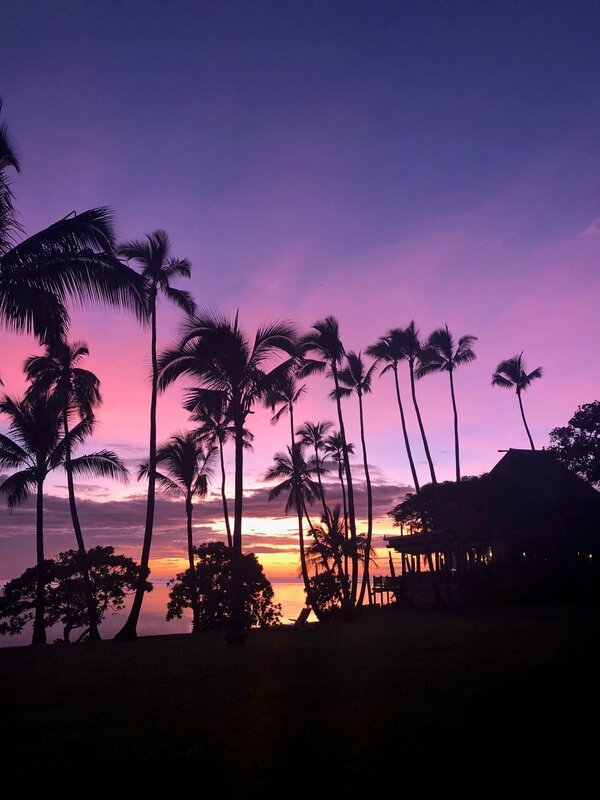 There’s a word you’ll hear all the time when visiting Fiji….. – “BULA”. “Bula” can mean many things. It can mean hello or welcome, cheers or good health. “Bula” is guaranteed to be delivered and received with the warmest smiles you’ll ever see. The Fiji Islands are an archipelago over 333 islands. How you spend your time there is entirely up to you. You could ‘flop and drop’ on one of the many pristine beaches, take advantage of the crystal clear waters and head out for breathtaking diving experiences, visit a traditional Fijian Village for an authentic cultural experience….Fiji has something for any traveler searching for an ultimate vacation experience. Fiji has always been on my bucket list, it’s one of those places I’ve wanted to visit ever since I was a child. I’ve been busy ticking off countries of the Europe variety over the last few years so I never seem to have any annual leave left for a cheeky few days of island time. When I was offered the opportunity to travel over and be hosted on a Denarau and Coral Coast trip by Tourism Fiji I was probably the first person out of 70 to sign up! Being already on ‘Fiji Time’ I cruised into Auckland Airport at around lunch time on Friday, checked in and found my trip buddies who were a nice group of ladies from around the country. We flew Fijian Air for our 3 hour direct Auckland to Nadi flight. This was a full service flight with nice food and drinks on tap (wine tastes even better when you’re going on holiday) there was no seat-back entertainment on the plane we flew on, instead we were supplied with headphones and there were drop down screens scattered throughout which played a pre selected movie. It was a small, slightly cramped experience in economy (business class was definitely calling my name)….. but that’s ok…. it’s only a 3 hour flight, it’s a reasonably priced airline, and we were going to a beautiful tropical island! 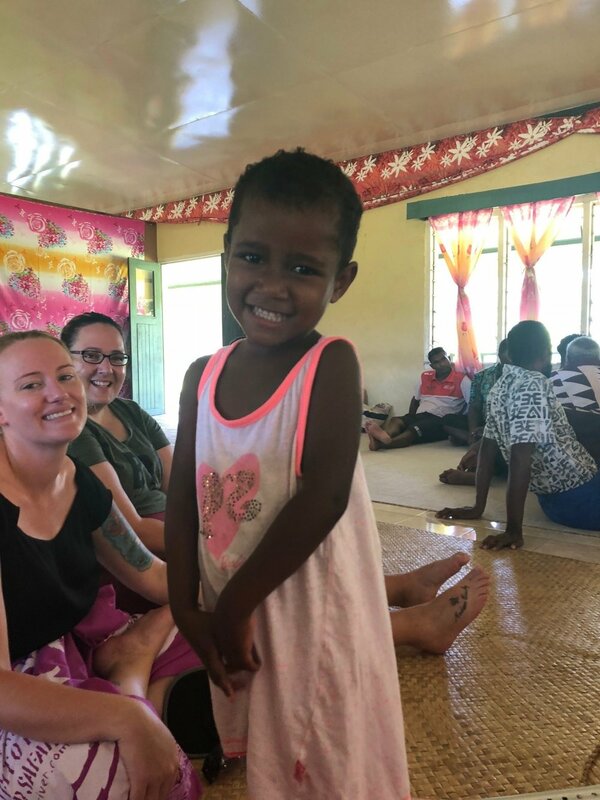 Sigatoka Cultural Village visit - how sweet is she! The second would be clearing up the confusion around the beaches on Denarau Island. If you’re wanting sandy, white, reefy beaches – you need to head out of Denarau to other spots such as the Coral or Sun Coast. Another popular option is to fly or boat out to the Mamanuca or Yasawa Islands for that real touch of paradise. Denarau has beaches but the sand is darker in colour, there are no coral reefs, waves or reefs to snorkel above. Having said that, if you are happy with the multitude of resort pools, and enjoy a nice sunset over water you will be quite happy. Typical of the South Pacific....you can swim and relax in water the same temperature as a warm bath. Upon our arrival at Nadi Airport we had our first of many encounters of a traditional Fijian welcome song with a big “BULA” at the end. Customs and bag collection was a quick and easy process and before we knew it we were on the shuttle for our first stop of the trip…. Radisson Blu Resort on the lovely Denarau Island. When we checked in at the Radisson we experienced what we would then experience at every resort we visited or stayed at - a large welcome by at least 5 friendly staff, they would be singing and playing the drums and we were offered welcome drinks - juice or coconuts and received shell or flax necklaces as gifts. Our bags were always transported from the bus straight to our rooms by butlers which we were very appreciative of as lugging bags in Fiji's heat and humidity isn't a fun task! We also recieved full buffet breakfasts at every resort, with all of them having an egg station where they would whip up whatever you asked for! 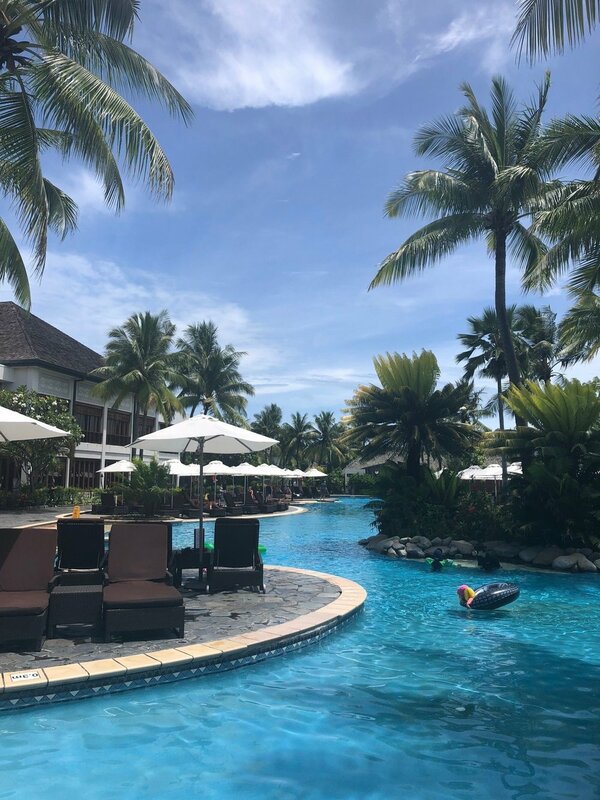 To be completely honest, I wasn’t overly excited to be staying at the Radisson, only due to the fact that is probably our most popular Denarau resort for families with young kids due to its fantastic facilities and I had visions of it being a noisy, busy resort and I was keen on quiet relaxation when we had our free time. I got my quiet relaxation! It never felt over crowded or overly busy. I really enjoyed my stay at the Radisson . It is well set up not only for families but couples as well. 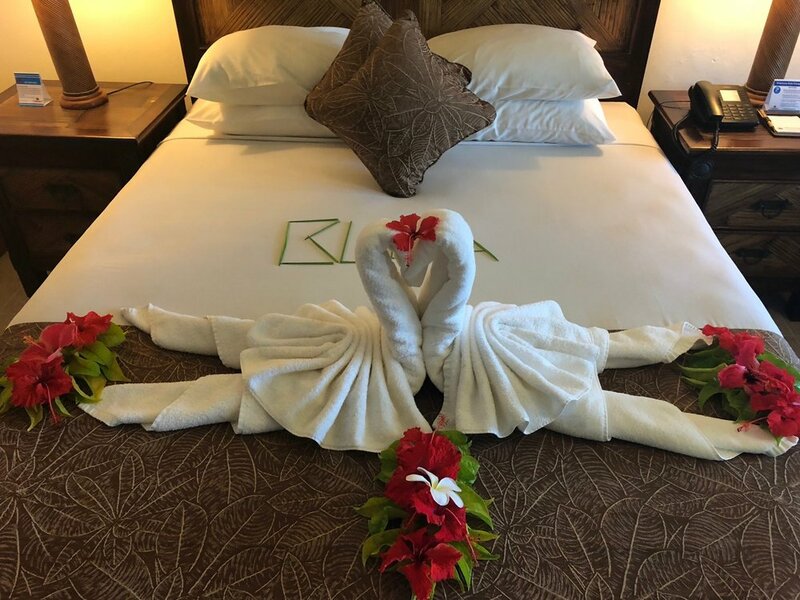 The resort is set amongst lush gardens with the odd waterfall here and there, traditional Fijian architecture mixed with the modern comforts of home and well sized and appointed rooms. There are 4 climate controlled pools including a swim up bar where we spent a fair bit of time AND an adult only pool. 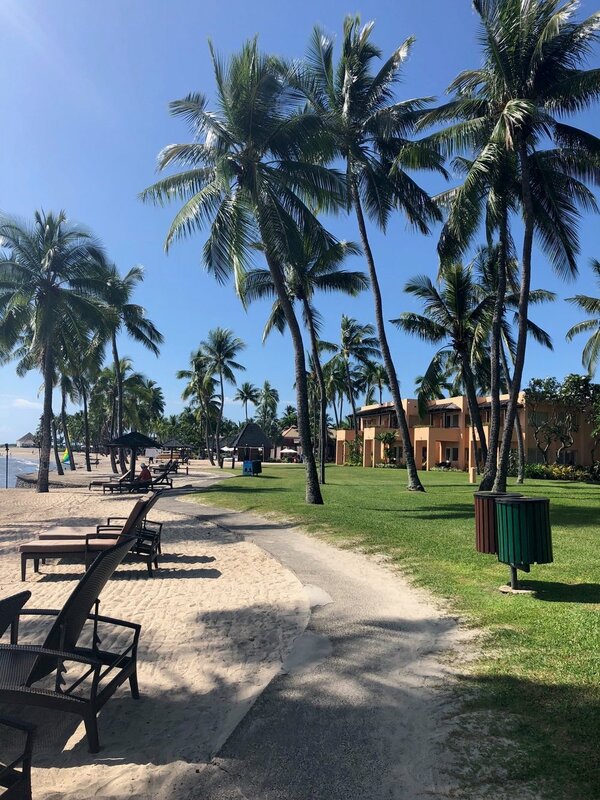 The Radisson also features 6 restaurants – best buffet breakfast we had in Fiji, direct beach access, plenty of watersport options, kids club and the most amazing spa that uses Pure Fiji products – always a hit with us kiwis! 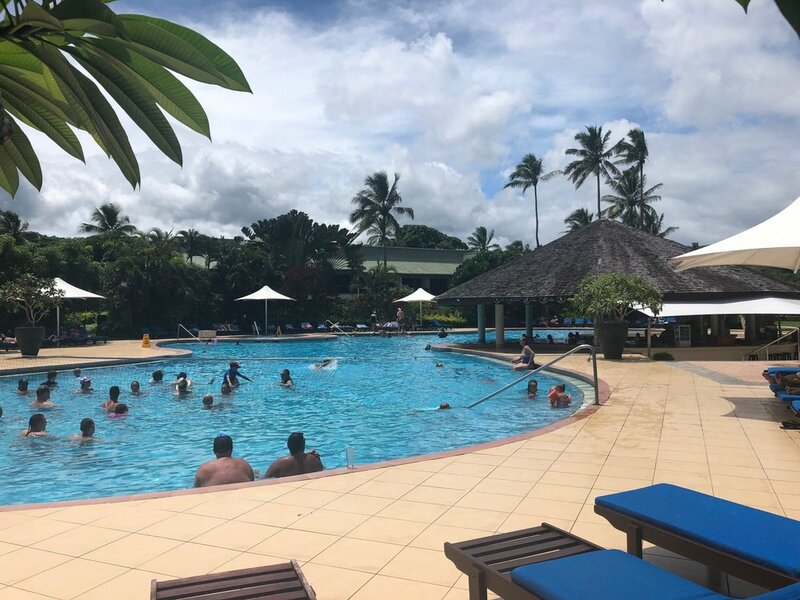 We did a brief evening visit of the Hilton Fiji Beach Resort and Spa for a function on our first night (Friday) and saw the adults only pool area (one of 7 pools in total) which looked stunning – one pool had loungers in it which we all thought was a marvelous idea. 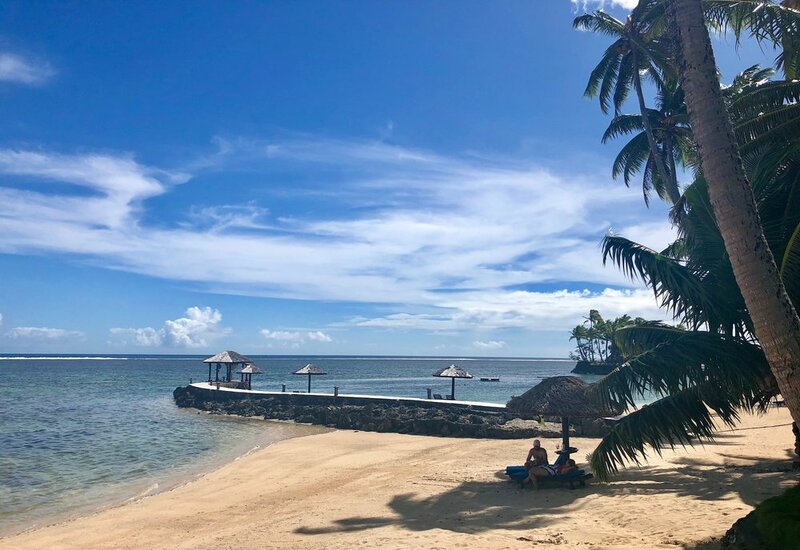 It is quite a spread-out property – covering 2.5km of the beach and they run their own version of the Bula Bus transporting people to and from their rooms. Unfortunately, we didn’t get to see any of the rooms but being a Hilton I’m sure they wouldn’t disappoint. 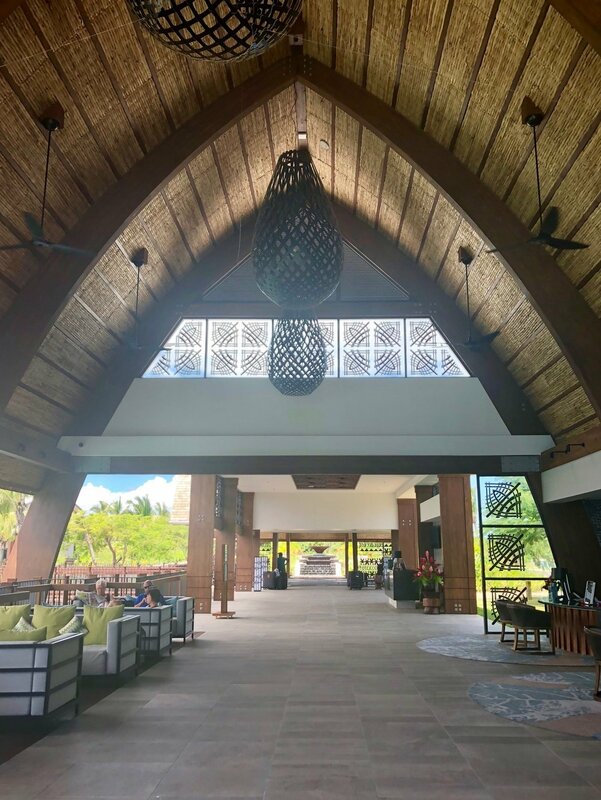 The next 2 days – Saturday and Sunday we were at the Sofitel Resort during the day attending Tourism Fiji’s conference which consisted of small groups of us visiting around 52 stands with various Fijian accommodation and activity suppliers. Great for expanding my knowledge base and I brought home around 3kg of brochures and information! On Saturday night, we were treated to a Sunset Dinner cruise with Captain Cook Cruises. 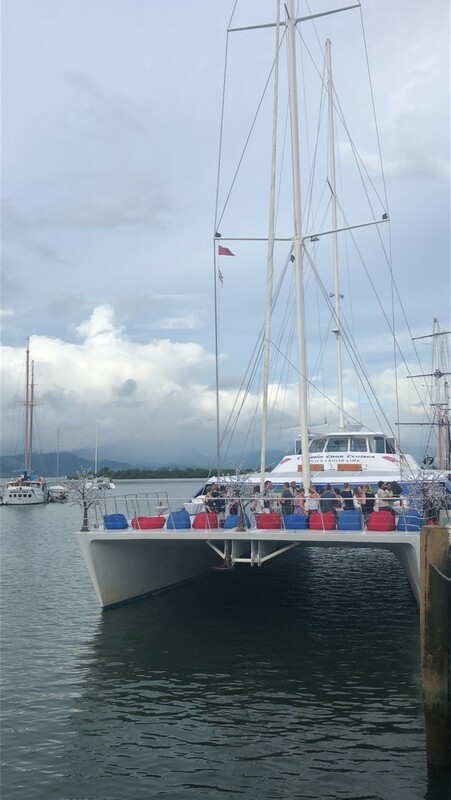 There were 50 odd of us and we hopped on the ‘Fiji One’ which is a beautiful big catamaran where we drank, ate and danced the night away. You receive 1 complimentary welcome drink, BBQ dinner, and access to a cash bar where you can buy extra drinks as you cruise past the Denarau resorts. We also saw some spectacular scenery of the Mamanuca Islands and weather dependent you can get a pretty perfect view of the sunset. By Sunday night we were all looking a bit worse for wear but this was the end of the conference and our last night all together so we were looking forward to our trip to Malamala Island. Malamala is part of the Mamanuca Island group and it is a the ‘World’s First Island Beach Club’, perfect for those who want to that tropical island experience who are staying on the mainland. Malamala is 25 minutes boat from the Denarau Wharf and is offered as a day trip. We went over at 6pm, after it had closed – again due to the large numbers in our group. The island is delightfully small – you can walk around in 20 mins and is surrounded is a beautiful sandy white beach with a reef which is great for snorkeling. There are beachside cabanas you can hire, a stunning infinity pool and they offer complimentary use of non-motorized equipment and free WIFI. The Chef is Fiji's celebrity chef Lance Seeto and we were offered a delicious array of Canapes and drinks. Monday morning dawned and we packed our bags, eager to get started on our tour which was down on the Coral Coast. After we said our goodbyes to our new friends, our group shrunk from 50 to 5 people and we headed down the coast to go ziplining at Zipline Nadi. It was here that we got our first experience of the real Fiji. We spent close to 3 hours here and completed an incredible 16 ziplines with beautiful views over the outer islands. Having ziplined in other countries there are definitely a few things you must consider when doing it in Fiji. 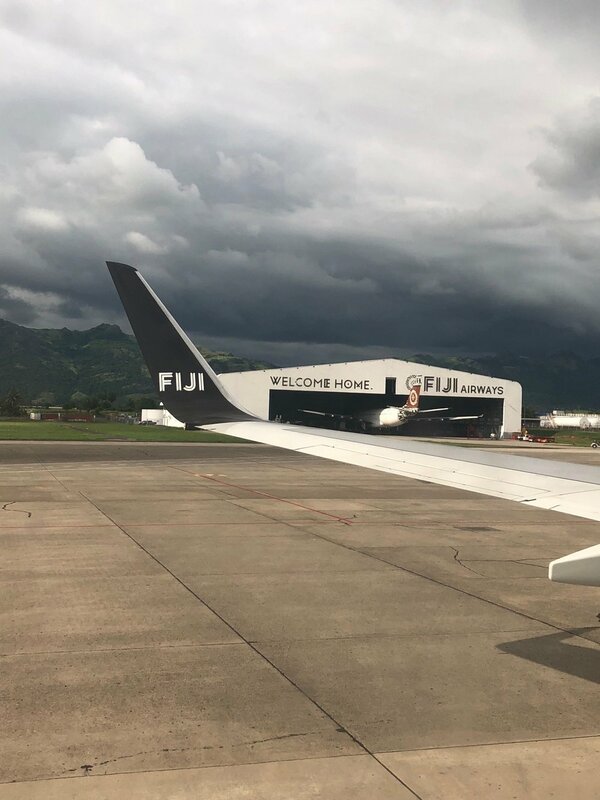 Firstly… Fiji time! Secondly – the stairs! We did A LOT of climbing, up very steep, small, rickety stairs. We were also not hooked on to any safety lines when climbing or waiting on the platforms for our turn which did my fear of heights no favours. The platforms didn’t have any fencing around them – was just a long way down to the ground. For this reason I wouldn’t recommend Zipline Nadi to anyone with young kids or anyone that didn’t have a slight level of fitness. If you’re a mildly responsible adult however – go for it! Who doesn’t love an adult sized flying fox. A true representation of the prestigious Marriot brand, Momi Bay is a 5 star island retreat like no other. Being quite a popular spot with the celebrity’s, I have it on good word that Leonardo DiCaprio is visiting later this year! We ate lunch at the Fish bar (don’t be fooled by the name – it offers more than just seafood) which has million dollar views over the infinity pool and out to the ocean. Our dietary requirements as a group were fussy to say the least and they catered for us brilliantly. The food - burgers, salad, pasta, steak was delicious, great sized portions, reasonably priced and the cocktails hit the spot. We spent a very enjoyable few hours sitting chatting with the staff. Somewhat reluctant to leave paradise we then hopped in the van and headed down the Coral Coast to our accommodation for the night, the Shangri- La Fijian Resort & Spa. I had never stayed at a Shangri-La property before but from what I know about the brand I was expecting to be pretty impressed. It is situated on Yanuca Island which is connected to the mainland by a 30 second drive over a bridge. It's a very expansive property, spread over lots of lush, tropical gardens, a huge golf course, a stunning wedding chapel, and they are spoilt with both a lagoon and a beach - it's a really nice location. We were greeted by 5 or 6 staff with a welcome song and we were offered cold towels and drinks which were lovely. The we jumped onto a golf cart and went for a bit of a tour. It's quite a confusing place to navigate on foot. There are a couple of different locations for guest rooms, there are a few blocks of rooms located near the family pool, lagoon, shops etc and the rest of the rooms are set back further in the garden (also with a pool) which require a bit of a hike to reach the facilities, however they have a stunning view over the beach and the sunsets are picture perfect! The Shangri -La is currently undergoing renovations (March 2017) to most of the property so is currently a total construction site in certain areas. They are planning on turning the rooms set in the gardens and the pool close by it to an adults only area and keeping the rooms near the family pool as family rooms which I think is a great idea. We viewed a couple of the recently renovated rooms and they looked great, were bright and modern with nice spacious bathrooms. They have also fully refurbished most of their restaurants and they look great. We stayed in the garden rooms, which haven't yet been renovated. They were very tired, definitely in need of a spruce up, so watch this space! 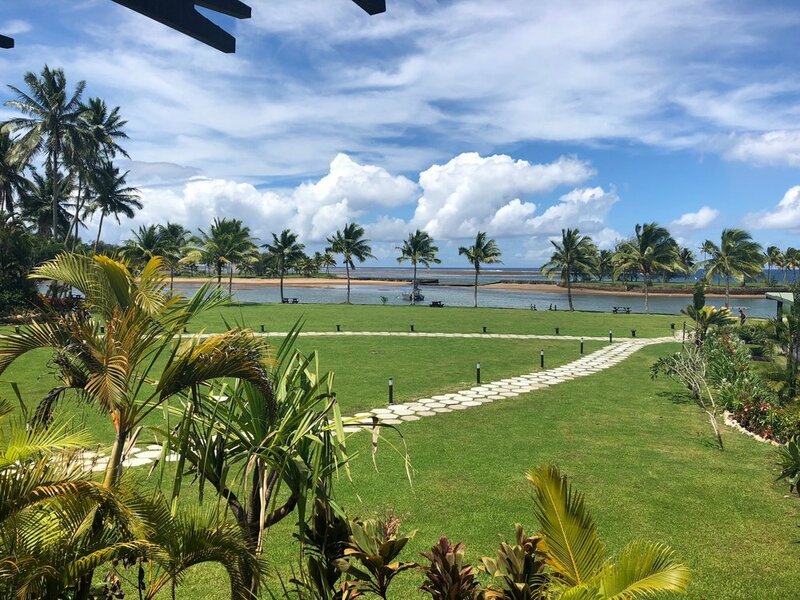 We ate at their Italian restaurant, the service was extremely slow (Fiji time) however we enjoyed being serenaded by three lovely gentlemen, the food was delicious and we had a lovely view of the lagoon. Looking back and comparing the Shangra-La to other the other places we stayed later on in the week it definitely wasn't my favourite due to a few small things such as room location, service speed and value for money. Having said that it was very busy when we were there and everyone seemed to be having a good time! The best Creme Brulee I've ever had at the Shangri-La! Tuesday morning came around quick enough and we were off once again. Our first stop was at 'Hot Glass Fiji' which is a glass blowing studio run by the talented Alice and her husband Alex from their home. 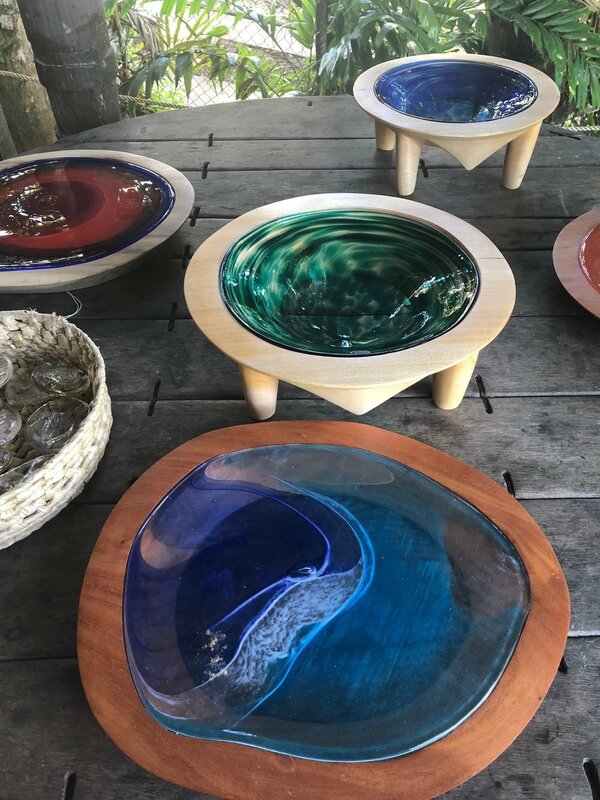 Originally from the UK they both create and display glass and you can go there and watch their creations come to life or even have a go yourself and make a memento to take home. They have a little shop where you can purchase items to have shipped home and the loveliest golden retriever dog! Then we headed off to the Crows Nest Resort Fiji, a little 3.5 star, 38 villa boutique property. It is 10 minutes drive from Sigatoka and 75 mins from Nadi airport. It is set into the hill side, across the road from a lovely beach - a very quiet area with nothing to do but relax! The staff were all friendly and welcoming. We looked at their premium villas which are situated high up on the hill (they have a golf cart to transport you to and from) have beautiful views over the resort and beach. They were lovely and modern with nice amenities. We also checked out the family rooms which were more motel style - apparently they get a lot of long stay guests. 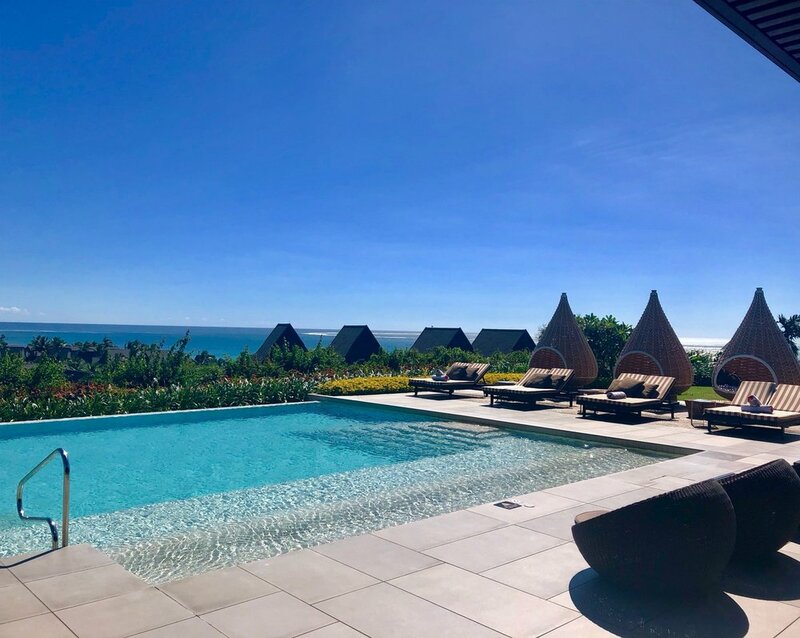 The highlight for me was the stunning pool, surrounded by a huge deck which lead on to the the main restaurant is situated in the same area and it provided a very relaxing atmosphere! I would recommend staying here for a couple of days of pure peace and quiet, to read a book by the pool and do not much else. There are no other resorts in the vicinity but there are restaurants, shops and activities you can book in Sigatoka village. Crow's nest - Deep fried ice cream (coated in cornflakes) the most delicious desert i've had in a long time! After our delicious lunch we headed off to the Kula Eco Park. This afternoon we were running behind schedule as one of our members broke her toe (not Fiji time!) so we had to go and collect some crutches for her. Kula Eco park traverses hillside, forests, streams through walk-through aviaries and animal displays which you can explore from the wooden walkways to the elevated path through the rainforest. The majority of the inhabitants of the park are hundreds of species of colorful birds such as parrots and doves. There's also iguanas, lizards and boa constrictors which you can handle; tropical fish, turtles and soft corals in an aquarium and flying foxes. Unfortunately during our visit it absolutely poured down which cut our tour short and also meant no photos were taken! 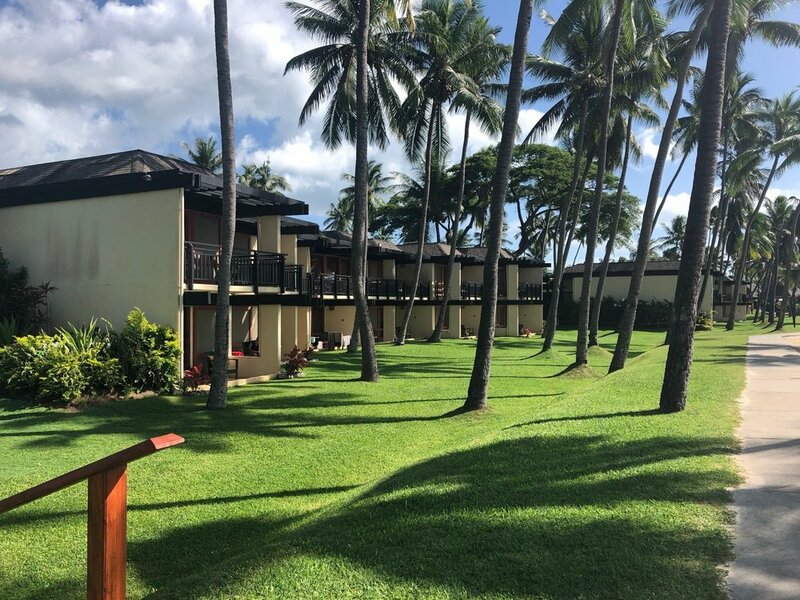 Virtually across the road from the Eco Park was our accommodation for the night - The Outrigger Fiji Beach Resort. The moment I stepped out of the van I loved it. The location is stunning. It has a huge open aired lobby area with a view over the entire property, right over the bure's out to the beach. There is also a spa set up behind the lobby on the hill along with a wedding chapel which both have incredible sea views. The rooms were divine, the perfect mix of traditional and modern. We were lucky enough to be in an Oceanview room which had the most stunning view over the bure's in the garden and the beach. There are also ocean view bure's - perfect for honeymooners. A massive bonus for me was the separate adults only pool area, with a swim up bar. You walk through an open aired function room that opens up onto the pool area. They hold most of their wedding receptions here so unfortunately it closes at 5pm daily. It is a very private area and set well away from the main pool giving you a real sense of peace and sanctuary. The main lagoon style pool is a massive asset to the Outrigger. It winds down past the restaurants, under a bridge to a small spa pool. It's huge! We all absolutely loved the Outrigger, cannot speak highly enough about it and wish we had more than one night here. The one and only downside of staying here is that you only get 1/2 an hour of free Wifi each day. It is approximately $25 FJD per day for unlimited Wifi. We did mention the fact that Kiwis love free Wifi to the Sales Manager and hopefully in the future they might offer a free service. Despite this I would without a doubt go and stay there again. Wednesday dawned and we were off on an adventure! The Sigatoka River Safari! We departed from Sigatoka village on a 20 minute bus trip to the wharf. Then we took a 40 minute jet boat ride to a remote village, where we had a Kava drinking ceremony, lunch in the community hall with some of the villagers, had some entertainment with singing and dancing then back to Sigatoka with the jetboat driver throwing in some 360 spins. We were grateful for the refreshing splash of water on that hot day! Had a great day and it was a real eye opener to visit an authentic Fijian Village. It was obvious that no one had a great amount of money or possessions but they were all just so happy! Two things to remember for this is to wear a t-shirt (no bare shoulders allowed) and you must wear a sarong - men and women (the river safari gives everyone one to wear and you get to keep it as a souvenir) Just before you leave the village you get the option to present gifts to the villagers. We didn't think to take anything (as you're not reminded or told you need to take anything) but some of the others in our group gifted rugby balls and money. As the Chief said - gifts are not expected but are welcomed. Most of the rooms at the Hideaway Resort are bures which makes a nice change to big blocks of buildings. They had differing levels of comfort and were scattered throughout the grounds with some having garden views and others having ocean views. Almost all rooms have a outdoor bath which was a nice touch and something we hadn't seen anywhere else. We stayed in an ocean view bure with a stunning view of the sea from our little balcony but unfortunately we had an uncomfortable nights sleep as although there was air conditioning and a fan there are no windows - just shutters and bug nets. We found that even with the shutters closed most of the cool air escaped outside and we had a hot and restless night. The bathrooms were not air conditioned and the fittings were old and rusted. There is one large pool with a waterside which was overlooked by the main bar / restaurant. We encountered lots of families here, lots of noise and not enough loungers for the amount of people wanting to sit poolside. We ate at their restaurant both dinner where we were served burnt, oily garlic bread and luke warm pasta. We were treated to a caberet show by some of the resort staff during dinner, we had a laugh but it was of questionable taste and definitely more of an R16 event and there were small children everywhere. The bar area had a great atmosphere and the staff were really fun. There was always music playing along side a seemingly never ending trivia game before the limbo stick appeared and we retired for the evening! The breakfast buffet offered a fair selection however when we arrived there at 9am they had run out of condiments and it took 10 minutes for us to find someone to put more plates out. The Hideaway definitely isn't a luxury resort, it gives off more of a cheap and cheerful vibe. Parts of it are so peaceful and tranquil and in other parts it felt almost like I was at a party at a hostel bar. The location is stunning and the rooms scattered throughout the gardens and palm trees give a real Fiji vibe. There is always entertainment going on in the main pool / restaurant area and children are well catered for. The guests we saw and spoke to were all having a great time and it has plenty of guests who come year after year. Thursday morning dawned and after a quick dip in the pool we were off to visit the 4 star Naviti Resort. 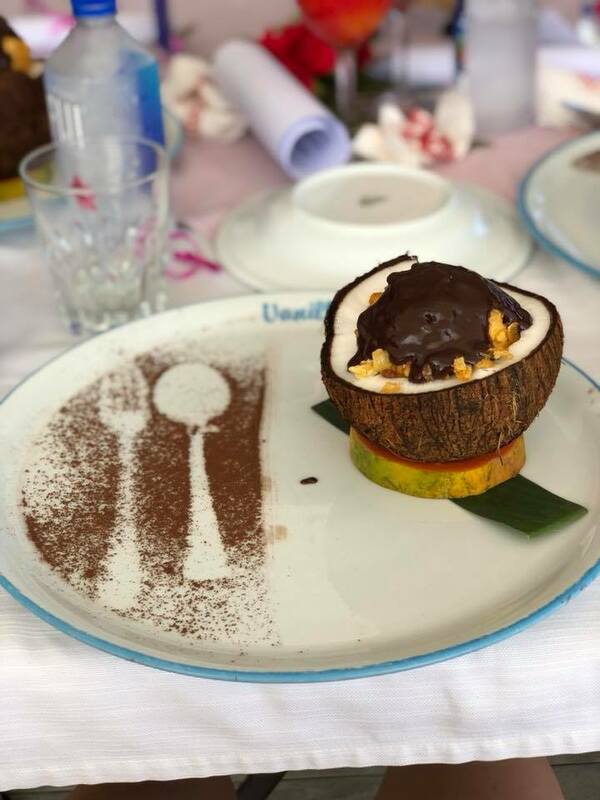 Nestled within 38 acres of vibrant, tropical gardens and fronting bronzed-sand beach, the Naviti is all inclusive property meaning meal and drink packages are included in the accommodation price. We took a tour around the facilities and rooms and were impressed with the quality and cleanliness of the rooms. There's a lot of garden here with plenty of trees and pretty flowers on display. 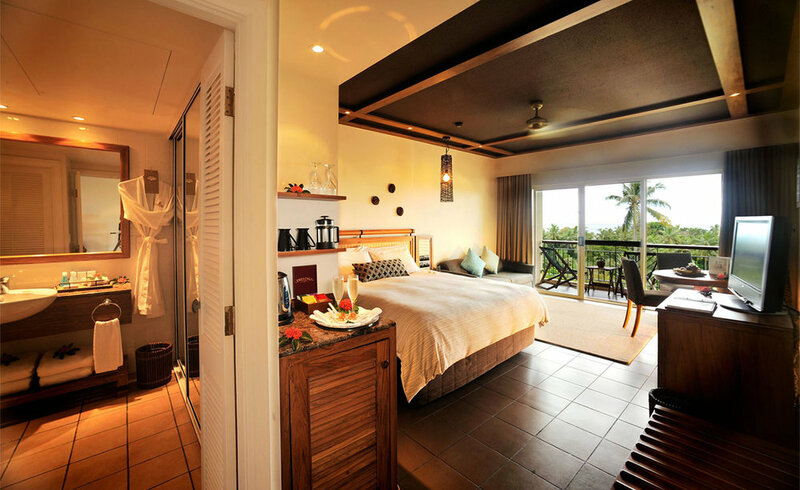 The rooms are all a good size and combine the dark traditional fijian wood with white painted walls and big windows and doors so the rooms all are bright and airy. They offer a few family room options with adjoining bunk rooms. The pool is huge and features a swim up bar which we took a quick dip in before a buffet lunch in the main restaurant. I had not heard of the Naviti before, it is a sister property to the 5 star Warwick resort which means it's operated to a very high standard. Went down to check out the beach, it's more of a lagoon with darker sand - the reef is much further out so no snorkeling immediately off the sand. There is a wee island across the lagoon which we saw people horse riding on. Our stay this night would be at the Warwick Resort. One of the girls on our trip had stayed here before and had been telling us how wonderful it was so we were excited to arrive! I had an Ocean View room which had views over both the adults garden and also the lagoon. Room was well appointed with a large bathroom. The bed was a super comfortable queen and also featured a larger than normal balcony to sit out and watch the sunset on. Downsides here were the smell of 'damp' unfortunate this is common with in room air conditioning in high humidity environments. Some properties we saw have a perfumed smell pumped out with the air conditioning which masks the smell somewhat. There is a separate adults only pool, garden, beach area and families are very well catered for with their own pool, spa and sheltered beach. Staff we found to be genuinely really friendly and wish to cater to your every need. There are four restaurants - buffet, Italian, Japanese and brasserie style food. The breakfast buffet was enormous and featured freshly made crepes and pancakes which were a huge hit with us. 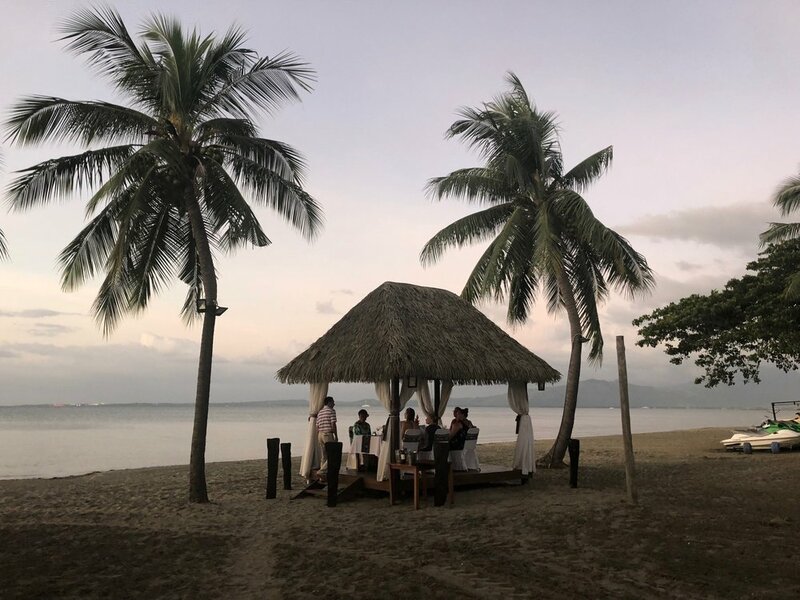 The Warwick also boasts a beautiful seafood dining experience in the Wicked Walu restaurant which was a short walk out across a causeway into the lagoon - beautiful food and spectacular sunsets from the outside deck. As we were a group of fussy mostly vegetarians the manager Charles had asked we be served the Italian Menu in the Wicked Walu restaurant so we could still experience it. Plenty of deck chairs and shelters across the entire resort and it is very pleasant to lay down on one of them under a tree watching the reef surf and lagoon and just drift away. We had a wonderful stay and I would highly recommend this beautiful resort. On Friday morning we had a leisurely sleep in before saying goodbye to our favourite property and heading to the Yatule Resort for a quick visit. It is located beside the InterContinental Fiji Resort and Spa which was our stop for the night. 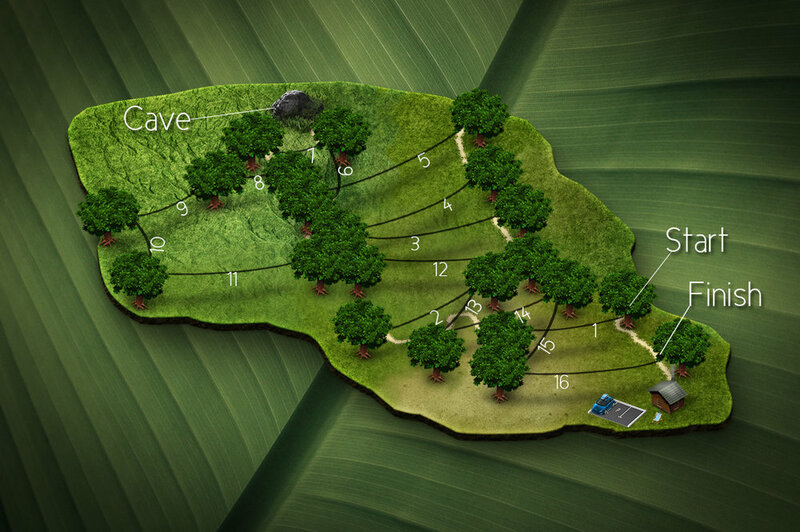 The Yatule is a small, boutique property offering no more than 40 small garden bungalows. We were now down the coast far enough to find the best beaches on the mainland and these 2 properties had the pick of the lot. The sand was super white and there were actually waves! Much like a beach you would find over here in NZ. It was so quiet and peaceful at the Yatule we were actually unsure if there was actually anyone there until we met them at lunch! Tourism Fiji definitely saved the best for last! When we arrived at the InterContinental resort all of us were walking around with our jaws on the ground..... The entire property was immaculate, it was stunning, modern and looked like it was built yesterday. We had definitely hit the top end of luxury here! If you ever fancy a suite room or apartment with a private pool, they are in abundance here. We stayed in their lead in rooms which themselves were far superior to all of the other resorts we had stayed at. Every room has a Cleopatra bathtub and you are supplied with Pure Fiji bathroom products, we were happy campers! We swam in both pools, the large family pool and the INCREDIBLE infinity, adults only pool which lead straight onto the beach and into the ocean. There were plenty of loungers available and within minutes had found a friendly staff member to take our cocktail orders. We dined in the restaurant overlooking the infinity pool that night. The one and only thing I wasn't in love with about the resort was the dinner we had. I had a pasta dish and salad which were just OK, certainly not as good as the Outrigger or Warwick. After the best night sleep in the world's most comfortable bed we sat in the pool the next morning and declared to our tour leader Toups that we weren't leaving and that she would have to go back to Nadi without us. 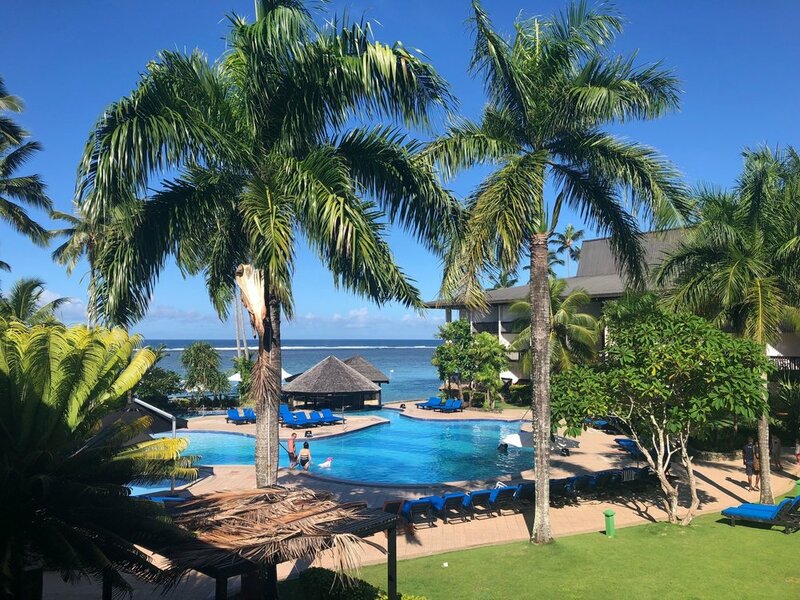 After some bribery surrounding happy hour in the adults only pool at the Sofitel Denarau (our accommodation that night) we all reluctantly piled in the van and left the best resort I've ever been too. We arrived in Denarau and headed to Rhum Bar which at the port for a spot of lunch. It is in a great spot, overlooking the marina and there were plenty of goings on with boats and tourists wandering around doing some shopping. The service here was slow, but the food was very well priced and delicious. This was our final day in Fiji and we finally had a whole afternoon of free time! Bliss! 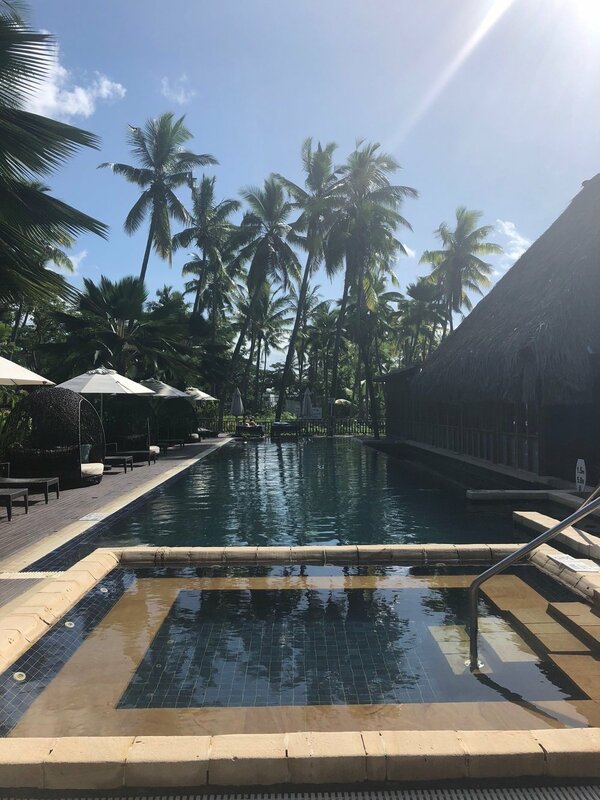 Keen for a massage and to explore myself and my friend caught the Bula Bus to the Wyndham Resort where we had blissful massages in their spa bure by the sea before making our way to the Sofitel via the Radisson, Sheraton, Sheraton Villas and the Westin Resort. 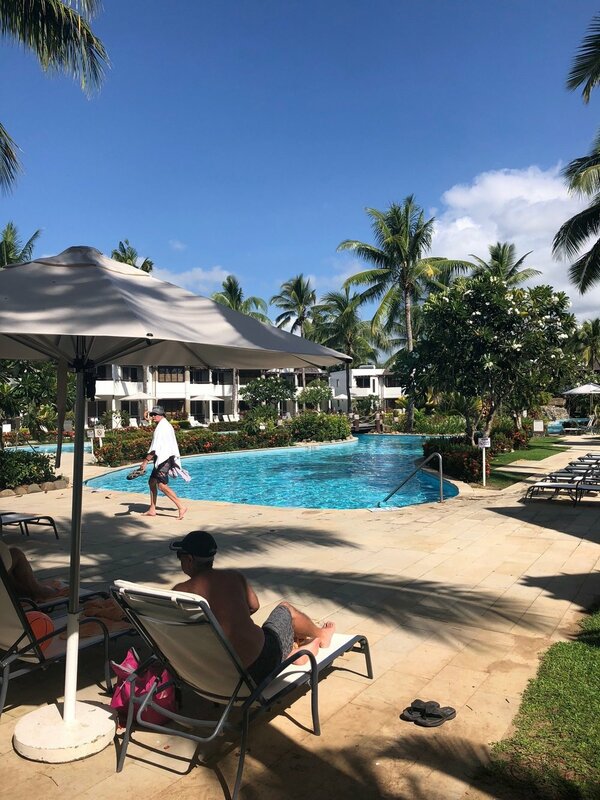 We wanted to check out the facilities (and by facilities I mean pools) at each property, the best thing about the Denarau resorts as you are free to move between all of them and use their facilities at your leisure. Adults only lap pool at the Westin - coldest pool we encountered - was so refreshing! While each resort had a different layout and 'theme' they are all lovely in their own right, all with access to the same continuous beach and beautiful stretch of sand. I hadn't realized how close the resorts are to each other, we walked past 5 resorts and if we were going non stop it probably would have taken 15 - 20 mins total. For our last evening we were treated to dinner at a bure on the beach! The sunset didn't disappoint, throwing pink and purple colours across the sky. There was a wedding being held in the chapel at the Sofitel and their reception was on the beach so we sat there listening to their live band, it was a lovely evening. I loved the Sofitel and it's big lagoon pool that snakes its way right across the front of the resort. There is also an adults only area called the Waitui Beach Club where you can be paid to be upgraded to a room in the adults only section and you have access to their infinity pool, complete with daily happy hour - free drinks and nibbles between 5 & 6 pm - which we took full advantage of! The next morning we were up early and off to the airport for our flight home. Flew on an Airbus A330 so we had in-seat entertainment - yay! I was sad to leave, but really treasure the memories created in this beautiful paradise and I will return!